One of the most useful applications I have for all my computers is Evernote. Evernote allows me to take notes on any of my devices (MacBook laptop, iPod Touch, iPad, Android phone) and the notes are synchronized and available on all the devices. Evernote even lets me record audio and take pictures (if the device has a built-in microphone and camera) and include them directly in my note. I classify Evernote as a must have application on my devices. But alas, I did have an issue with Evernote on my Android phone. I use Evernote to audio record meetings so that I don’t have to worry about taking detailed notes. When I stopthe recording and save the note, Everyone immediately synchronizes the note – now, this would normally be a good thing – but my meetings where taking place at a location where I did not have access to wifi. Audio files can get rather large. Synchronizing over 3G can be slow and expensive, especially if you are on a limited data plan. 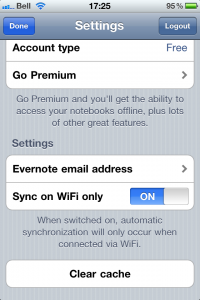 The trick is to change the default Evernote setting to synchronize automatically only when the device is connected via wifi. 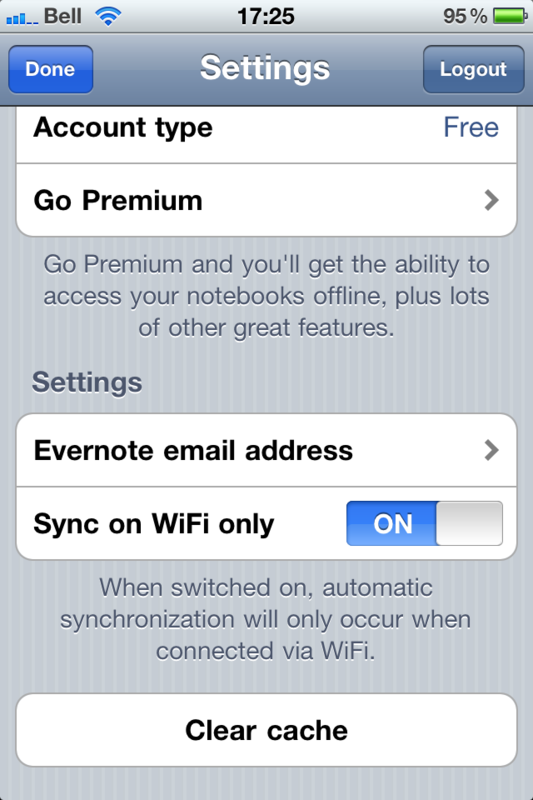 This option (Sync on WiFi only) is available from the settings menu in the Evernote application (launch Evernote first and find the settings option from the home page).